Hello, as i said i would bring the recipes i did for Valentines Day , this bread is delicious , warm hmmm your house will have nice smell of homemade bread. I left you tip you can add paprika or curry powder as you like , we love roasted chestnuts thats why i didn t mix any other flavour. i hope you like it !!! Mix together the flours,yeast, sugar and salt. Stir olive oil into 280l warm water and stir it into the dry ingredients. Leave dough to res in a ligthly oiled bowl , covered with oiled cling film, for 1-2 hours. ( i used towel , my towel for bread always the same and say my prayer , always to bread). Punch the doug with your fist to knock out out the air, add chestmuts and then knead it for more 2 minutes. Transfer dough to a greased baking tray and cover with oiled cling film. Leave to prove for 1 hour or until isdouble size. Bake for 35-30 minutes or until the loaf sounds hollow when you tap it underneath. Transfer the bread to a wire rackand leave to cool completely before slicing. Try to enjoy homemade butter or fresh presicuitto italian or fresh cheese . 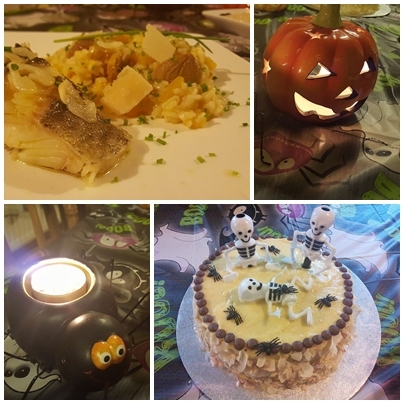 Hello everyone here is more participation in the facebook group Dia um…Na cozinha , In the kitchen, I took advantage and made this quite different risotto with pumpkin UK because here not because of the lack halloween and to not throw out the pumpkins and chestnuts and a delicacy very hard to find around here. When a challenge arises I always try to look for and study well what I will do, I chose this Gordon Ramsey recipe program and well known around here very old flame The F word. So I added nuts and already tell you that is delicious. Roughly chop pumpkin into small pieces. Sweat in a sauté pan with whole butter until soft. Return to a sauté pan and simmer until the liquid is dissolved and the puree is dry. For the Risotto :4 cups risotto rice,salted water, 2 cups mixed chestnuts, cooked (roasted oven for 25min.). Bring half the stock to a boil and season with salt. Boil the rice for 6 minutes or until al dente. Strain and transfer to a baking tray and cool. 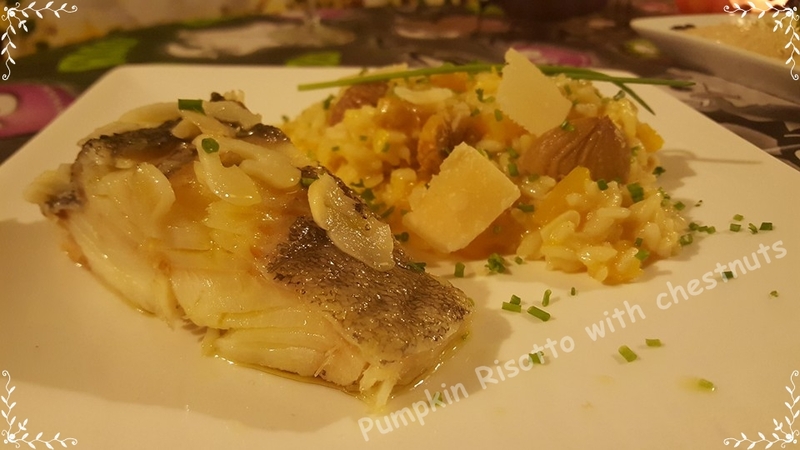 The remaining vegetable stock or salted water, Pumpkin Puree, 2 shallots minced, 1/2 tbsp chopped garlic, 2 oz white wine,2 tbsp mascarpone cheese,2 tbsp shredded parmesan cheese,-1/2 cup cooked chestnuts, Salt and pepper, Olive oil for sautéing. Sweat the garlic and shallots with olive oil. Add white wine and reduce until almost dry. Add risotto rice and in small amounts add stock until rice is cooked. Finish with the pumpkin puree, mascarpone, cooked chestnuts and season with salt and pepper.